Do you miss Barack and Michelle? It’s okay, I know, me too. Ready yourselves, then for this news: Barack and Michelle Obama have each signed a book deal with Penguin Random House to publish their memoirs for an untold but likely enormous sum of money. The Hollywood Reporter reported earlier today that the bidding for the memoirs went as high as $60 million, but the actual number that the books were sold for has not been released. If that’s even close to true, though, it will blow the previously-held record out of the water. Bill Clinton’s post-Presidential memoir went for $15 million in 2000, and while I’m sure that was a scintillating read, something tells me Barack and Michelle Obama’s might be better. 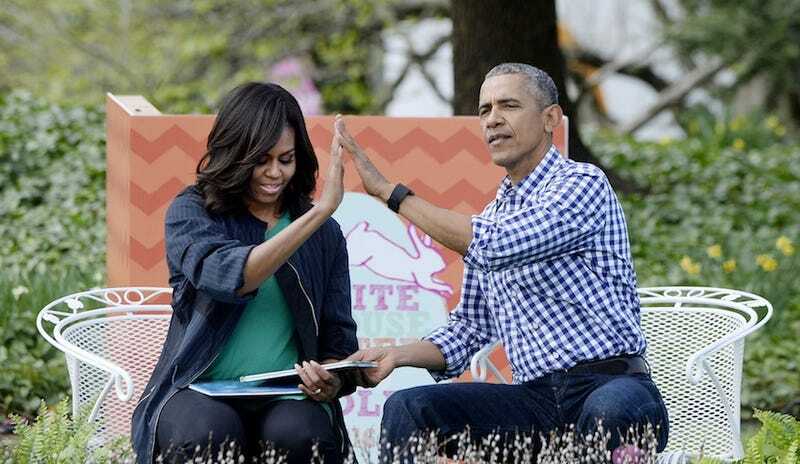 In addition to writing the actual books, the Obamas will donate 1 million books in their name to the non-profit First Book, which works to give new books to children in need. They’ll also be donating a “significant portion” of their book deal money to charity. Nice. There’s no publication date yet, but hopefully it will be soon. Obama is no slouch in the book-writing department, having published The Audacity of Hope and Dreams From My Father previously. He is an excellent writer and whatever comes out of his memoir will be interesting, I’m sure. Michelle, on the other hand, has been relatively silent about her time in the White House. That’s the book I want to read. That’s the book. I’m ready for.